Part of the Canarian Archipelago, Gran Canaria lies in a part of the Atlantic known as Macaronesia and is located 1,250 km (approx. 775 miles)from Cadiz on mainland Spain. The Canarian Archipelago consists of seven islands. Each one of the islands is unique, but Gran Canaria is notable for its lush vegetation and diverse landscape. 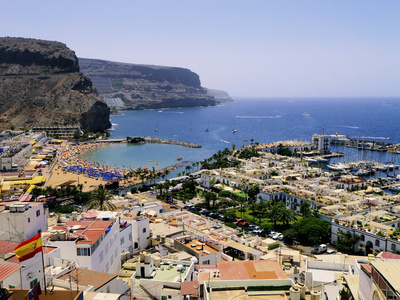 Gran Canaria enjoys a spring-like micro climate all year round with average annual temperatures fluctuating between 18 and 25 degrees Celsius (64-77 degress Fahrenheit). The miracle of this phenomenon is produced by the humid and fresh Trade Winds coming from the Azores Islands. As a result the island’s capital, Las Palmas de Gran Canaria, otherwise known as Europe’s California, is considered to be one of the cities with the World’s best climate. Anytime of year is a great time to relax and pamper yourself on the Island of Gran Canaria before late night feedings and sleepless nights become a routine. The island's diverse landscape offers beaches and sand dunes along the coast, thick forests of pine trees covering the mountains, wonderful palm groves surrounding the gorges in the south and fertile valleys in the north. Those that have experienced these overwhelming sights know why Gran Canaria has the reputation of being a “miniature continent”.